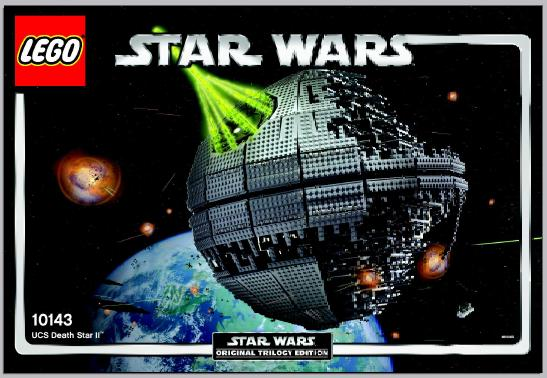 Released in 2005, the UCS Death Star II sold for $298.99. 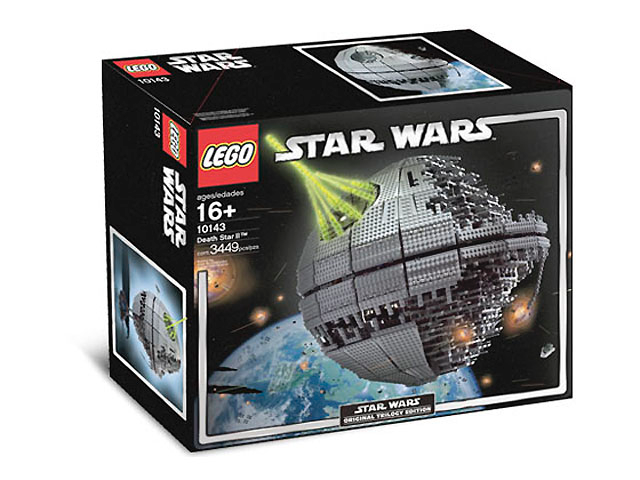 The set contained 3441 pieces. As of July 2016, used copies were selling for about $893 and unopened sets for $1720. When I take an average used price for all of the parts that make up the set, I get a value of about $980 making it more worthwhile to just purchase a complete used set. However, you may have a lot of the parts that make up this set already. For such a large set, I find it interesting that the parts distribution is so low. There are only 148 unique elements. (For comparison, the most recent Millennium Falcon 75105 has 294 unique elements.) That means that on average the individual elements appear a great many more times. Before I discuss the LEGO parts themselves, I think that it's important to talk about the sticker. The sticker itself is not integral to the build of the set. It I however vastly important to the completion of a set, especially when selling. There are a number of fakes out there. I am not qualified to tell you what to look out for with fakes, I just don't have the experience with spotting them. Stickers can be found already affixed (used) or still attached to the original sheet (new.) It's important to take into account if they are damaged or wrinkled or off center. Frankly, there's a lot of reasons why people hate stickers. In the past six months, used sticker assemblies have sold on Bricklink for $22.98-$100. In the same time frame, no one has sold a legitimate new sticker sheet, but 2 sellers are hopeful in the $240-$250 range. The first element of note is Element 50990a. The single Light Bluish Grey Dish 10 x 10 Inverted (Radar) - Hollow Studs averages about $12.50 used, but you'd easily be able to find one for closer to $7. 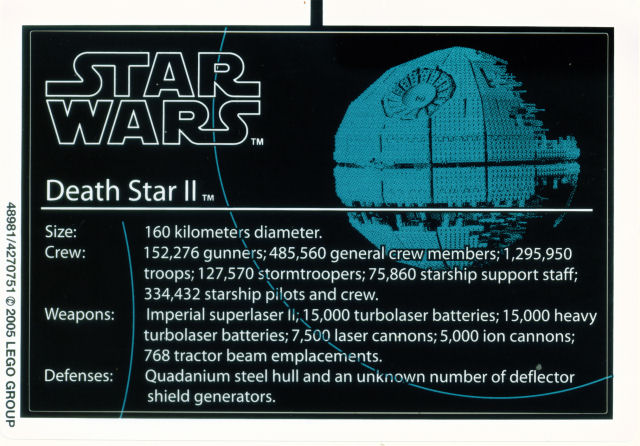 It is found in 4 sets including 8971 Aerial Defense Unit and 10188 Death Star. You need 4 Technic, Brick 5 x 5 Right Angle (1 x 4 - 1 x 4) in red. Element 32555 is found in one other set, 8652 Enzo Ferrari 1:17. In order to get all 4 from a single seller, it's going to cost $10-$11 each. You want to watch that if you buy this set, someone hasn't substituted the black ones that sell for about $1 each. This next part falls into both of my categories. You need 32 element 30364 in tan. The Hinge Brick 1 x 2 Locking with 1 Finger Vertical End appears in 2 other sets, 4482 AT-TE and 7665 Republic Cruiser. Right now, no single seller on Bricklink has the quantity that you need used. You can find them in the $8 range, but you're going to need to make multiple purchases and that's going to push up your average price per part. Be careful that someone does not substitute light bluish grey which sells for less than $0.10. There are 16 light bluish grey Lever Small Base with Light Bluish Gray Lever in this set. Element 4592c05 appears in 7 sets. You can find what you need for about $4 each from a couple sellers. If someone switches for the black levers on light bluish grey base, they'd be spending just a few cents for each one. Coming in at an average of $4.39 each, element 3937 is next. One seller has a large quantity New for $3.34 each. You need 16 tan Hinge Brick 1 x 2 Base which appears in 3 other sets. If you wanted to cheap out, light bluish grey, dark bluish grey or black are easily found for about $.03 each. The Light Bluish Gray Wedge, Plate 4 x 9 without Stud Notches sells in the $3-$4 range. Element 2413 appears in 11 sets including one that we talked about before, 10175 Vader's TIE Advanced UCS. Significantly cheaper Light Bluish Gray Wedge, Plate 4 x 9 with Stud Notches can be found for $.48 so look out for that substitution. It seems like a weird choice to have a Pearl Dark Gray Technic, Liftarm 1 x 15 Thick. I mean it's the only part of that color in the set. You need 16 element 32278, which appears in 5 (or 4 if you don't count the Turbo Tank variation) set. One seller has the quantity that you need for $2.66 each, but the average is $3.67. Honestly, I don't know why they didn't use the much more common black one that sells for $.30. Element 42445 appears in 10 sets. Trans-Clear Bar 12L with 1 x 2 Plate End Solid Studs and 1 x 1 Round Plate End is not terribly expensive, averaging $0.90 for the 1 that you need. You could get one for as little as $0.25. Element 99784 is a similar piece, so make sure that if you want a completely authentic set that you get the right one. For just the 9 elements listed (excluding the sticker) we are looking at an average price of about $535. That's more than half the price of the set for 103 pieces. I want to be very clear here. When I am speaking about alternative parts, I am not in any way saying that they are official substitutions. These would be parts and pieces that might allow you to build this set on a budget, but should be disclosed if you ever decide to sell the set. It might be good enough for you, but someone purchasing one for their personal collection may assume that they received all the rare pieces and get mad if you do not disclose the differences. They would also be key pieces to look out for if you are concerned that someone is not selling you an official as manufactured set. Some of the pieces that make up this set appear a great many times. If I limit the search only to parts that appear 35 or more times, I come up with 19 different elements. (NOTE: I am not going to duplicate anything that appears in the previous list.) These 19 elements encapsulate 2219 pieces which is almost 65% of the set. I cannot stress enough that this is by no means a complete inventory of this set. I am ignoring a large number of different elements. This is just a survey of the more notable parts and pieces that make up this set. The light bluish grey plate, 2x8 comes on strong with 259 being the count. Element 3034 averages $0.18 each. 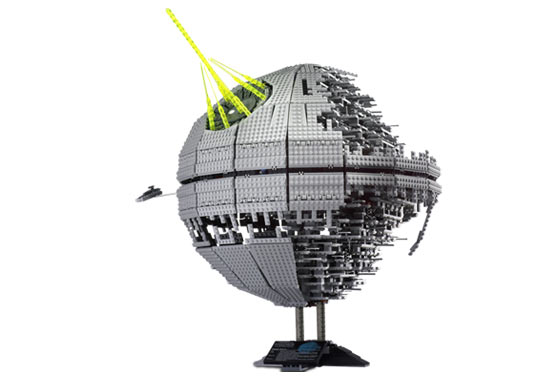 It appears in 258 sets, with 10188 Death Star being the runner up for most numerous with a distant 39. You also need 238 black technic brick 1x2 with axle hole. Appearing in 181 sets, element 32064 averages $0.04 each. The next closest set has 26. You need 169 light bluish grey 1x4 plates. Occurring in 479 sets, element 3710 is the most common piece so far. It averages $0.08 each. The UCS Millennium Falcon requires almost as many at 142. Probably the single most common part in this set is the black Technic, Pin with Friction Ridges Lengthwise WITH Center Slots. Element 2780 appears in 1790 sets. They average $0.01 each and you need 72 of them. There are a bunch of technic sets that require hundreds of these in each set. You need 66 black Technic, Pin 3L with Friction Ridges Lengthwise. Each element 6558 averages about $0.08. It appears in 405 sets. Next, we need 61 light bluish grey element 3023. 614 sets have the 1x2 plate in this color. The average cost is $0.05 each. You also need 56 Trans-Neon Green Brick, Round 1 x 1 Open Stud. Averaging $0.05 each, element 3062b appears in 55 sets. 46 element 44570 come next. The light bluish grey Hinge Plate 3 x 4 Locking Dual 2 Finger appears in 43 sets. These average $0.37each. Not surprisingly, you need 46 element 44568 to go with the previous piece. 94 sets include the light bluish grey Hinge Plate 1 x 4 Locking Dual 1 Fingers on Side. These pieces aren't too bad at $0.05 each. You need 45 black Technic, Axle and Pin Connector Angled #3 - 157.5 degrees. For $0.10 each, you can find element 32016 in 146 sets. The light bluish grey Technic Bush 1/2 smooth shows up 43 times in this set. Element 4265c appears in 491 sets and averages $0.02 each. You will need 42 light bluish grey plate 2x16. This part appears in 106 sets. Each one is going to average $0.39 each. You need 35 each of Elements 47397 and 47398. Both the left and right version of the light bluish grey Wedge, Plate 12 x 3 are going to average close to $0.40 each and appear in 40 sets each. To accumulate all of these most numerous pieces, you'd spend an average of close to $218. That's before all of the shipping on what is bound to be many orders. Thankfully, there are no minifigures with this set. They'd just be expensive and completely out of scale for this set. If you feel like your Death Star is not complete without instructions, it's going to be a bit of a chore and a bit expensive to find them. There's none available on Bricklink or Ebay right now. It seems like they have sold in the past for as much as $240. Fear not, the Death Star plans are in the main computer. That's right, LEGO has it available for download on their website. You don't have to get into a running gun battle or send your droids to a crazy dude who lives in the desert just to get them. The box is yet another expensive "nice to have" for this set. It appears to be equally as rare as the instructions. I couldn't recommend spending several hundred dollars for a cardboard box, but if you're missing it and the set doesn't feel complete without it, good luck. There are none currently available. That makes it a seller's market. If you want to talk about this epic set, try the official thread. All images are the property of Rebrickable.com, Bricklink.com, Disney, Lucasfilm Ltd. and the LEGO Group. I've already done the preliminary work on Imperial Flagship. I was thinking of taking a look at Grand Carousel and UCS Snowspeeder after that. I bricklinked a flagship 2 years ago. That had quite a few pieces that are rare or exclusive to that set. Nice job on the death star! Great job as usual. Looking forward to the GC.